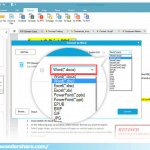 This Wondershare PDFelement Review was revised and updated on October 15, 2017. Wondershare PDFelement is all-in-one PDF editing software which provides professionals, PDFelement is among the best solution for all PDF operations without breaking a bank. It allows you to create, edit, and convert PDF files easily. With OCR technology, you can convert scanned file into editable PDF. The interface is friendly with easy navigation and available in Windows, Mac and iOS. It is the way to go if you work with PDF. No wonder professionals rate it as the best affordable PDF software. Create and combine web pages, text files, images, etc. to PDF files. Edit PDF text, images, watermark, and pages. Reuse PDF content in Office documents, HTML pages, and EPUB eBooks,etc. Built-in OCR makes text in image-based PDF files editable and searchable. Edit and fill out PDF form hassle freely. 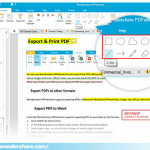 Wondershare PDFelement is a professional PDF editing tool to edit and convert scanned PDF with leading-edge OCR technology with three platform (Windows, Mas and iOS). 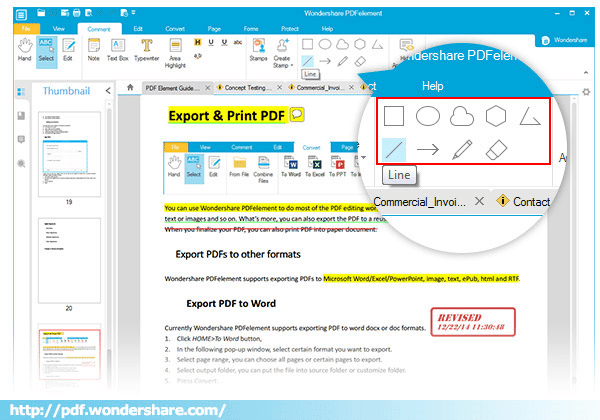 Wondershare PDFelement ability to edit PDF documents is very impressive. You can edit PDF documents contents by just a simple click and editing the text. In fact, you can change the color, font size and font of the document. It also has the capability of editing images using the insert, crop, resize and delete options. You can add new pages, extract, re-organize and delete pages also. In addition, it is capable of inserting, deleting, and updating watermarks. When editing is complete, you will have the option of compressing the final document and send it as attachment to emails, uploading or printing depending on what you want. 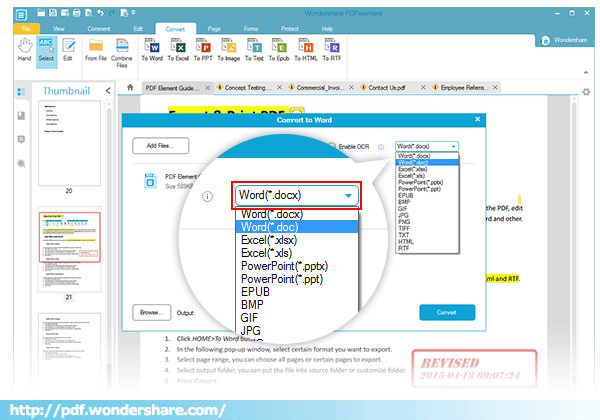 Wondershare PDFelement can convert various formats like converting to word and other Microsoft office documents, HTML, RTF as well as some image file types which include JPG formats. The final image can be read using Acrobat, Adobe reader and other PDF readers. With advanced OCR technology, converting scanned documents into an editable PDF becomes easy as reading ABC and this is not even all. You can convert your written signature to a digital one to make your documents authentic when you use the software and you also have the choice of choosing any of the standard encrypted digital signatures if desired. Security of your documents has been taken care of in Wondershare PDFelement platform as you can easily apply permission for your document through setting of password or you can even blackout an image or a specific text to be visible to the user. It does not matter if you do not understand English because the software provides multi language support to users. Besides English, other available languages include Korean, French, Russian, Italian, Turkish, Czech, Ukrainian, Japanese, Polish etc cementing it presence as true global software. Some of the reasons why Wondershare PDFelement is rated so high above others are because it has excelled where other competitors have not excelled. For example, it has advantage over others when it comes to speed. The speed of the product performance is leading in the industry. It has an impressive record of running, opening and saving files within 3 seconds. Its edit function is perfect and as easy as Microsoft office and let’s not forget, it has bates numbering making it perfect for working with legal documents. 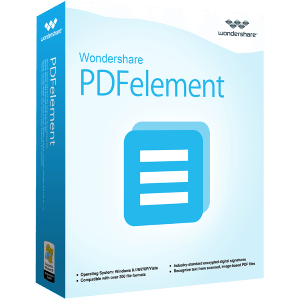 Wondershare PDFelement is certainly one of the best all round PDF software that is not just only easy to use and flexible but is also equipped with all the capabilities that meets every business and personal needs at a reasonable cost. Wondershare PDFelement boast of a robust customer support service which is available to provide support for customers at anytime and it include FAQs, webinars, video tutorials and a dedicated support team.